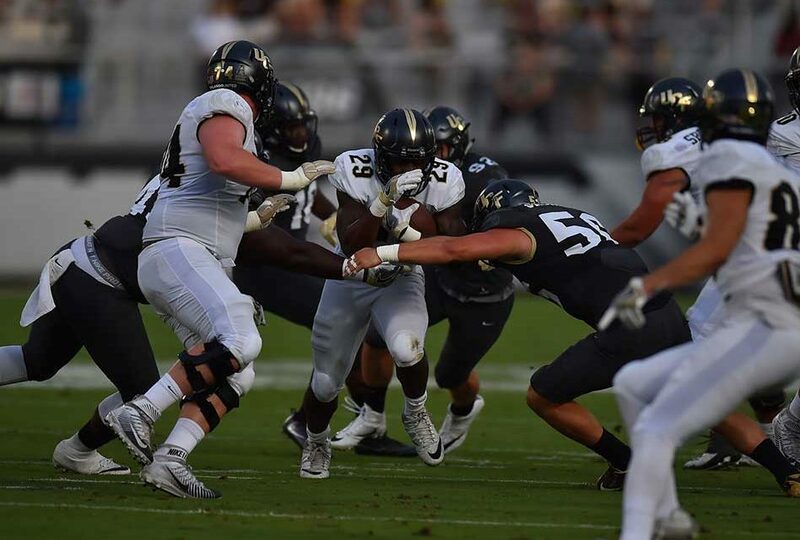 UCF Football fans will have their first opportunity to see the Josh Heupel-led Knights inside Spectrum Stadium at the 2018 UCF Spring Game presented by Dex Imaging, which is set for April 21 at 6 p.m.
General admission tickets are free. 2018 season-ticket holders can click here to print/manage their tickets. Fans who have not purchased 2018 season tickets, can click here to register and receive free general admission tickets. 2018 premium season-ticket holders (Tower Club, Stadium Club, Carl Black & Gold Cabana) will have free access to their seats for the Spring Game. Those tickets must be claimed in the fans’ TicketMaster account prior to April 18. For those who do not already have premium season tickets, but would like to sit in one of the premium sections for the Spring Game, tickets are available. Spring Game prices for premium areas are as follows: Tower Club – $20, Stadium Club – $10, Carl Black & Gold Cabana ($5). Click here to purchase premium seating. More information on activities surrounding the UCF Spring Game will be announced in the coming weeks.